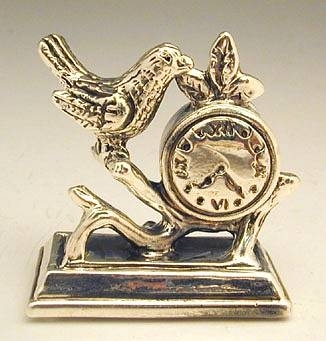 Sterling Silver Bird Clock Miniature Unique artisan 925 sterling silver (NOT silver plated) bird clock miniature. 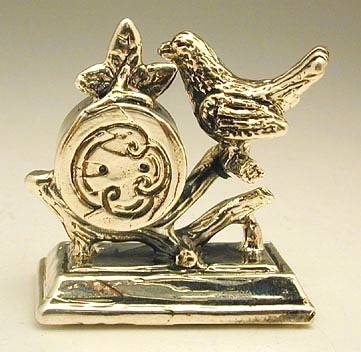 Beautifully designed as an highly detailed round clock and a bird standing branches. Set on rectangular, stepped base. This item was made in the electroforming method. Measurements: Height: 4cm. / 1.575in. Base: 3.8cm. x 2cm. / 1.496in. x 0.787in. Weight: 13gr. / 0.418oz. Marks: 925 for sterling silver.